THE STORY - Shmuel, a Hasidic cantor in Upstate New York, distraught by the untimely death of his wife, struggles to find religious solace, while secretly obsessing over how her body will decay. As a clandestine partnership develops with Albert, a local community college biology professor, the two embark on a darkly comic and increasingly literal undertaking into the underworld. THE GOOD - A solid performance from Geza Röhrig, strong direction and an interesting examination on the nature of grief. THE BAD - Matthew Broderick feels out of place. Some of the comedy doesn’t land. Most of the other performances come up short. It feels like two different films with one part stronger than the other. There are several films out in the world that attempt to tackle the difficult subject matter of grief. It is a complicated issue to broach, but when done properly, it is a way to give meaning behind a time in one’s life that feels utterly devoid of one. It can similarly be a fascinating exploration to examine this topic while wrapped around certain cultural identities. That is precisely what “To Dust” aims to discuss, and in the end, it is a flawed yet very engaging story that features some fine performances to admire. 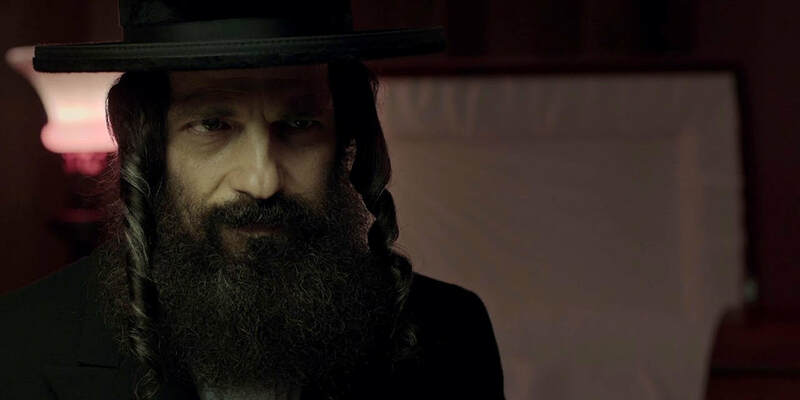 The film stars Géza Röhrig, as a Hasidic cantor named Shmuel. He is a man who has just lost his wife to cancer and is currently battling a conflict within him as he imagines how her body will decay. Seeking more knowledge in this area, he contacts Albert (Matthew Broderick), an inept science professor at the local community college. The two of them explore this scientific process as far as they can in the hopes that eventually it can settle Shmuel’s troubled soul in the face of his questioning faith. For a film that has such obviously limited means, there is quite a strong sense of direction that Shawn Snyder brings to the piece. Many of the scenes have a simple yet dynamic sensibility to them, and you are eagerly drawn into the world of these characters. There are tonal shifts between the somber reflection of grief and the overtly comic “odd couple” bits, but the film manages to surprisingly shuffle between the two rather effectively. The storytelling here has a confidence to it that does not patronize the audience watching it nor the culture it is portraying. There is an authenticity represented here that is truly felt. Much of that authenticity can be attributed to a well-conceived screenplay. Snyder and co-writer Jason Begue hone in on this society with a unique set of religious teachings that never come on too strong and are used to help push the narrative around its central character. The examination on how one deals with grief juxtaposed against these ingrained ideals is one that is fascinating to see unfold. Still, one does feel disappointed whenever the film switches from its sole focus on Shmuel to when he shares the stage with Albert. Even as the shifts are not that jarring, those scenes do feel as if written for a completely different film and does manage to undercut the genuine dramatic pathos that was being discovered. It’s not the worst comedy seen, but it does feel unnecessary when everything else apart from it is quite strong. Röhrig gives a solid performance here, even if it doesn’t reach the heights of his turn in the Oscar-winning “Son of Saul." Once again, he provides a grounded and mostly inward facing performance that showcases the sadness and turmoil he is going through. Röhrig captures the conflicted nature of this man’s battle between faith and rationality and provides some real tender moments to see. The film truly does feel like a stronger piece whenever Shmuel is the focus, and much of that is due to the care with which Röhrig plays this character in a simple yet complex way. Broderick, on the other hand, is not necessarily bad but his character is one that is clearly providing comic relief, and in doing so comes across a bit too broad. His absent-minded professor distracts and, even though there are a few good one-liners, ultimately feels unnecessary. The chemistry he shares with Röhrig also feels awkward and unnatural, and not in any way that legitimately helps the film. Most of the cast is populated by a serviceable ensemble with some admittedly weak child performances. It really is Röhrig that provides the best performance in the film. Ultimately, the film is far from perfect but it does many things quite well. Despite some of the comedy not landing and not every member of the ensemble giving particularly strong performances, the central story is one that is quite endearing. The showcase of how grief and loss collide with religious teachings and insecurities is a fascinating thing to witness, and the story manages to successfully dive into those waters. The central performance is particularly strong and conveys much of the silent power that is placed within the story. There are certainly better films that have touched upon this subject before, but this is still a fine one to watch as well.